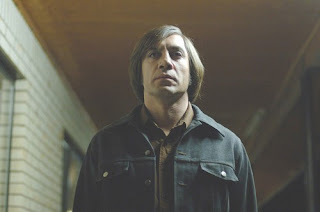 No Country for Old Men, based on the novel by Cormac McCarthy and written and directed by Joel and Ethan Coen , is easily my favorite film of the year, especially surprising because the departing 2007 turned out to be a solid year for American films. Letters from Iwo Jima, Zodiac, Valley of Elah, Breach, Gone Baby Gone, Children of Men , The Assassination of Jesse James by Coward Robert Ford, 3:10 To Yuma and some lesser lights kept the movie going a pleasure, and even the more blatantly commercial and pandering movies I saw, under the excuse of their being guilty pleasures (Live Free or Die Hard, Resident Evil: Extinction) were sure footed enough in premises and execution to not dilute nor drag down my impression that the lot of us are about to leave a year of unusually good film releases. One does hope that Ridley Scott finds his footing again and can make a film as good as his past successes--Blade Runner, Blackhawk Down, Gladiator--because the glamorized Scarface/Serpico move he attempted with the listless and static American Gangster renews that annoying question you ask yourself when you walk out of his more recent efforts: what was the fuss about him anyway? One would wonder as well when Denzel Washington might lose that nasally wavering monotone that's become his signature vocal tic, or when Russell Crowe might convince an audience again that he can act and not merely memorize his lines and hit his marks. No Country for Old Men is one of those Coen brothers films that doesn't miss a beat, doesn't miss a trick, and which makes use of each rhythm it invents and each trick it employs in service to the story with the sort of mastery that makes you forget that you're viewing something that was meticulously constructed. Seamless, in other words, as was their Fargo, a comedy that worked in broad, slowly applied strokes of the brush that inspected the ticks and quirks of the characters as they headed for their eventual comeuppance. Hubris is a striking theme in the Coen's movies, and it appears again in their new thriller, where one has the simplest of conflicts, a trailer-living Vietnam vet comes across a bloody drug deal gone bad and tracks down the two million dollars that was meant to seal the deal, and finds himself, through random occurrence, sheer chance and whimsical decision, being tracked himself by a hired killer. Well.....yeah. Praise the lard and pass the malnutrition!